Around 9:30pm on the night of Sunday, March 18, Stephon Alonzo “Zoe” Clark was murdered by Sacramento police in his own backyard. Police fired 20 shots while his family inside the home took cover. SacPD questioned his family for several hours about what they heard before his grandmother, Sequita Thompson, dared to push the window curtain aside and saw her grandson’s body. That’s how she found out he’d been killed. Predictably, the Sacramento Police Department has done their best to criminalize Clark. First, they claimed that Clark was armed, but then their story changed and they claimed that he was holding a toolbar. It has since been revealed that the only item found nearby was his cell phone. We know that police lie and criminalize victims in order to shift blame. We cannot trust them to investigate themselves. However, there is body camera footage. Sacramento city council policy dictates that video footage and audio recordings be released within 30 days of the shooting but SacPD Chief Daniel Hahn has promised the council that the footage would be available to the public by the end of the week. We know that video footage clearly demonstrating police misconduct does not automatically lead to justice. A joint investigation between the SacPD and District Attorney Anne Marie Shubert is ongoing but we know that District Attorney Shubert has a pattern of declining to prosecute killer cops who murder Black people. The cops who murdered Dazion Flenaugh and Joseph Mann are free today. 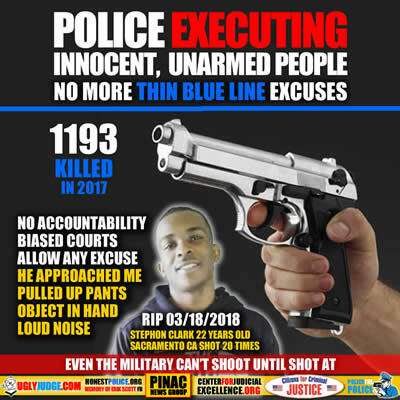 Just because someone calls 911 police can’t arrive and start shooting at innocent people without anyone actually pointing a weapon at them. Not to forget the families and children in the homes where these reckless, cowardly officers unloaded their weapons. Police shot at a man 20 times in his own yard, thinking he had a gun. It was an iPhone.